The inflamatory rhetoric of this printed circular provided an antislavery perspective of events in Kansas. 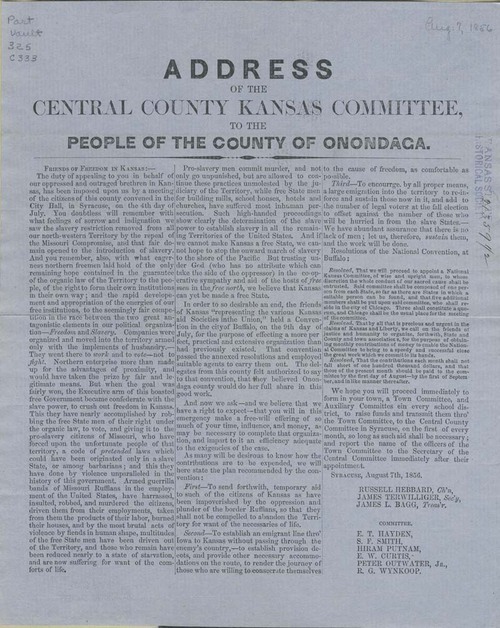 It urged the residents of central New York to provide aid to Kansas settlers. It also described plans to encourage a "a large emigration into the territory" to aid free state supporters living there but to also increase the number of "legal voters" for the fall elections. The chairman of the Central County Kansas Committee was Russell Hebbard. The document listed the names of other officers and committee members.